Andy Rudzinski, superintendent of the Bangor Wastewater Treatment Plant, talks about the function of the biofiltration tower at the plant in January 2016. Sewage and stormwater is run through the biofiltration tower at the Bangor Wastewater Treatment Plant in January 2016. 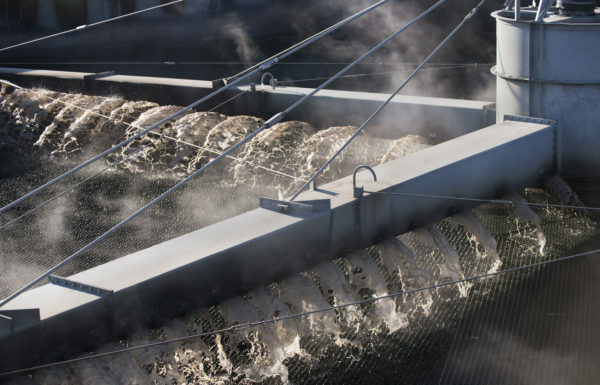 The plant cleans 8 million to 9 million gallons of wastewater each day. This photo of Bangor's Wastewater Treatment Plant on Main Street was taken in July 2014. 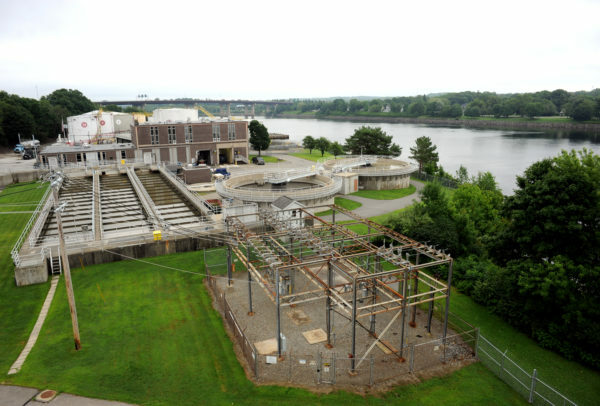 Bangor’s sewer rates may soon rise to help fund nearly $63 million in projects during the next 15 years to stop raw sewage and contaminated stormwater from spilling into the Penobscot River and Kenduskeag Stream. The first major project outlined in a city plan to meet a federal mandate under the Clean Water Act is an estimated $22 million installation of a 3.8 million gallon wastewater storage tank along the waterfront behind Tim Hortons. The work is expected to start in August and end by June 2021. It’s the first of several projects the city agreed to complete by 2032 in a 2015 consent decree with the U.S. Department of Justice, which was acting on behalf of the U.S. Environmental Protection Agency. City officials have not yet calculated how much sewer rates would rise due to the project and expect to apply for some state and federal funding to help defray the costs. “We’re going to go at this as cautiously as we can. The city is always aware of issues with costs and burdens, so I think we’re going to have to do the best we can,” said Andy Rudzinski, the city’s director of Water Quality Management. Bangor’s inability to prevent sewer overflow and contaminated stormwater from flowing into the river and stream has been a long and costly problem for the city. In efforts to comply with federal clean water mandates, the city has spent $42.8 million since 1987 upgrading its water treatment plant, adding storage tanks and separating many of its combined sewer and stormwater pipes, some of which date back to the late 1800s. Such combined systems initially were designed to collect rainwater runoff and raw sewage in the same pipes. 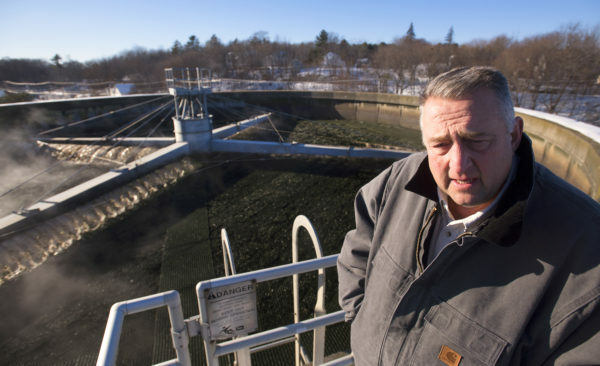 When there isn’t significant rain or snowmelt, the combined sewer system works well enough to carry all wastewater to the treatment plant where it is treated and released as clean water into the Penobscot River. When too much runoff goes into the pipes, however, the overflow of stormwater and sewage is discharged into the Kenduskeag or Penobscot at several points along the system. This keeps the treatment plant from being overwhelmed, but is environmentally hazardous. Since 1988, when the city began such combined sewer overflow projects, sewer rates have risen nearly 500 percent. Today, Bangor residents pay at minimum $78 per quarter on their sewer bills, according to city Financial Director Debbie Cyr. The planned $22 million storage tank, a large underground cement structure, would store millions of gallons of wastewater when the city’s treatment facility and pipes get overwhelmed, according to John Theriault, the city’s engineer. Once the runoff is under control again, the liquid in the storage tank would be sent through to the plant for treatment. With 635 million gallons of untreated sewer overflow entering city waterways annually, Bangor in 1991 agreed it was non-compliant with the federal Clean Water Act and entered into a consent decree with the federal Environmental Protection Agency, according to Tanya Emery, the city’s director of Community and Economic Development. The 1991 decree incorporated terms that were part of a 1987 consent decree with the Maine Department of Environmental Protection including the since-completed upgrade of its wastewater treatment plant. After spending $42.8 million on combined sewer overflow projects between 1987 and 2008, of which $6 million was covered by EPA grants, the city has since reduced its annual wastewater overflow to 40 million gallons annually, Emery said. The completed projects include a separate 1.2 million-gallon storage tank installed along the waterfront for nearly $1.3 million in the late 1990s, according to a summary of the work compiled by the city’s Engineering Department. But in 2015, the city agreed its remaining sewer overflow was still causing water quality violations and a new consent decree was issued, according to the EPA. The city experienced 21 combined sewer overflow events in 2015 and 23 in 2016, but officials hope the planned projects will reduce those events to just four per year. This will bring the city into compliance with the decree, according to Rudzinski. To comply with the decree, the city may need to complete an estimated $62.9 million worth of projects by Dec. 31, 2031. That amount would fund the installation of three storage tanks, including the one at the waterfront, and pay for the separation of more combined sewer and storm water lines in several areas of Bangor, according to the Chelmsford, Massachusetts-based engineering and construction management firm AECOM Environmental. AECOM was hired by the city to help develop the long-term plan that officials released on Jan. 31 outlining how the city should seek compliance with the decree. That plan still needs EPA approval, according to Rudzinski. The city will likely have to ask the EPA for an extension past the 2031 deadline to limit the financial stress the projects would have on some residents, according to AECOM. Bangor would experience a so-called “medium burden” as a result of the stormwater projects, the consultant firm reported. This would exasperate the struggles of some sectors of the city that are already facing a “high financial burden,” AECOM concluded. “Care will need to be taken to evaluate all of the [Clean Water Act] requirements and to prioritize project implementation in a manner that results in achieving the greatest water quality benefit while still being affordable,” the plan said. Emery said there are different funding mechanisms the city could use to help pay for some future expenses, such as applying for state revolving loan funds, which allow municipalities to finance wastewater projects at reduced interest rates. The city also would seek grant funding, she said. Wastewater system users would cover the total debt of the projects, meaning it would impact sewer rates but not tax rates, she said. Rudzinski said the city may not have to complete every project in the plan to comply with the decree if some of the projects perform better than expected. After completing each project, engineers will evaluate the actual overall impact it has on the city’s wastewater overflow problems, he said. The city should begin the waterfront storage tank project first because it “was determined to be the most beneficial initial major project due to the high level of [combined sewer overflow] activity at Davis Brook outfall and its location along the waterfront,” the plan said. “We are all hoping and keeping our fingers crossed that once we do some of these projects that they may actually work out better than anticipated.” Rudzinski said.